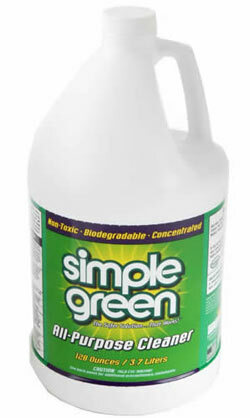 How often have you heard a friend say she uses Simple Green because it’s a “natural cleaner”? Maybe you’ve even thought the same thing yourself. And who could blame you? The company’s tagline says “We Are Simple & Green”. They advertise their products as “environmentally friendly” and “non-toxic”. But guess what? Several Simple Green products contain a chemical called 2-butoxyethanol, which is linked to reproductive harm like reduced fertility and developmental problems. We certainly wouldn’t call that “non-toxic”! Not only do Simple Green products contain 2-butoxyethanol, but they may contain other potentially harmful chemicals that they’re not telling you about. Simple Green keeps ingredients in dyes, preservatives, and fragrances a secret from consumers. This is especially concerning, because any one fragrance can be made up of potentially hundreds of synthetic chemicals. Fragrance can include chemicals linked to cancer, reproductive harm, and developmental harm; known allergens; and other chemicals of concern. If Simple Green’s not telling us what’s in their fragrances, we’re left to believe their products could contain any of these alarming chemicals. And until we know exactly what’s in their cleaners, it’s safer to make our own non-toxic products or to buy cleaners from companies that are disclosing all ingredients, like Seventh Generation. 1. Remove 2-butoxyethanol, which is linked to reproductive harm. 2. Disclose all ingredients in Simple Green products directly on the label. The good news is that Simple Green is a company that listens to its customers. In June, we asked them disclose whether they were using phthalates or synthetic musks in their fragrances, two chemicals linked to women’s health problems. They immediately provided a list of products that don’t contain those chemicals and committed to reformulate products that still contained them. So your voice matters; when you raise it, Simple Green listens. Tell Simple Green it’s simple: go green! On email? Take a few seconds to send one here. We deserve to know what’s in the products we’re cleaning our homes with, and that those products are free from toxic chemicals that impact our health. Learn more at www.womensvoices.org.